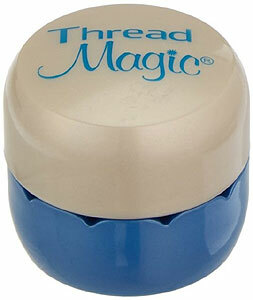 Thread conditioner is used to make embroidery thread easier to work with. You draw your thread over the conditioner and it adds a small amount of residue-free lubricant which helps stop fraying and breaking. We recommend it for working with metallic thread which is particularly prone to these problems. Acid-free and hypoallergenic, it comes in a small, easily portable pot with notches to help guide your thread and should last for many projects.